A classic old fashioned cocktail with a flamed orange peel, bitters soaked into a sugar cube, bourbon and a very nice cherry to add a bit of extra depth to this delicious drink. What is the difference between Manhattan and Old Fashioned? The main difference between a manhattan and an old fashioned is the sweetener used. A Manhattan uses sweet vermouth, a type of fortified wine, while an old fashioned uses a cube of sugar. An old fashioned will have a few dashes of aromatic bitters and is usually garnished with an orange peel, while a Manhattan gets a cherry. Why is an old fashioned called an old fashioned? An old fashioned is related to the first cocktails from the early 1800’s, which had a spirit mixed with bitters, sugar and water. They were superseded by more elaborate cocktails but came back into fashion in the 1860’s, this time being referred to as old fashioned because they had fallen out of favor for a few decades. 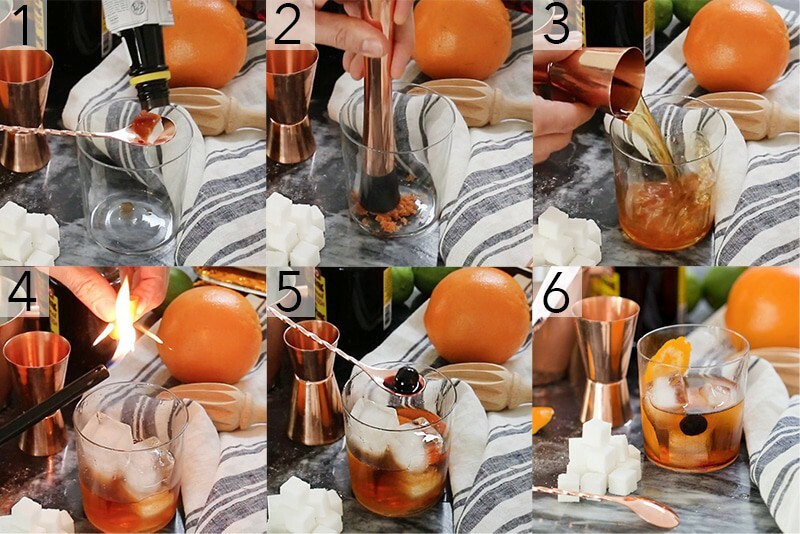 How Do You Make An Old Fashioned? Take the sugar cube, place it in a spoon over the glass and saturate it with bitters. 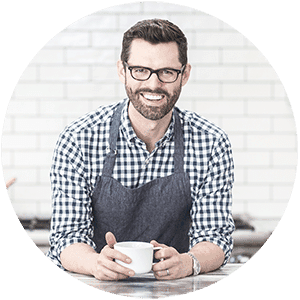 Drop the saturated sugar cube into the glass and muddle it or crush it up with a spoon to help the sugar dissolve more easily. Add 1 1/2 oz of bourbon and ice then stir it well. Now cut a one inch circle out of an orange peel. Using a match or a lighter, warm the orange peel up then squeeze it while holding it at a 45 degree angle over the glass. Wipe the peel on the rim of the glass then drop it in. Add a cherry and 3/4 oz of bourbon then give it a final stir. (I know adding a cherry is not for everyone but these Luxardo cherries are so so good! It’s basically like dessert at the end of a meal). You may want to add a small spritz of soda as well. Garnish it with a strip of orange peel and enjoy! 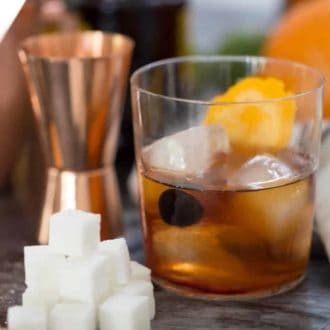 If you’ve tried this old fashioned cocktail then don’t forget to rate the recipe and let me know how you got on in the comments below, I love hearing from you! 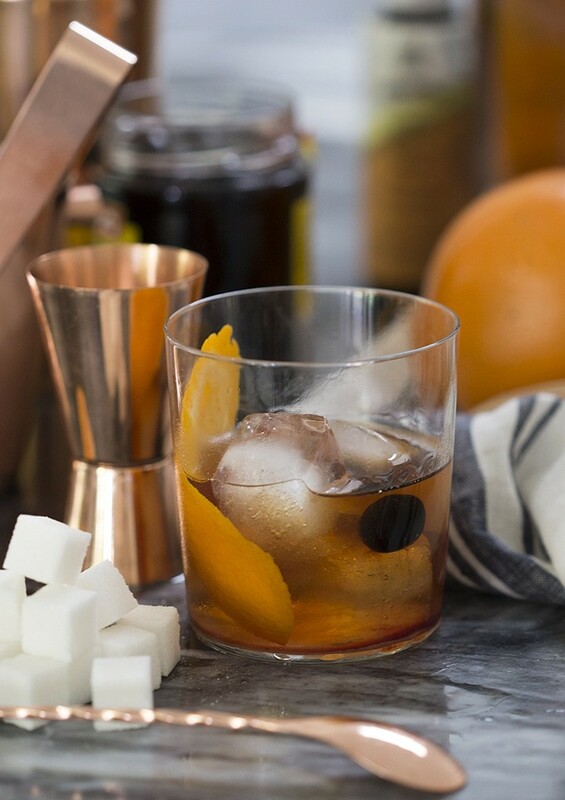 This old fashioned is the perfect drink for bourbon lovers. Cut a one inch circle of orange peel. Place a sugar cube in glass and saturate with bitters. Muddle the sugar cube and then add 1 1/2 oz of bourbon. Using a match or lighter warm the orange peel up, then squeeze while holding at a 45 degree angle over glass. Wipe peel on rim of glass and drop in. Add cherry, and 3/4 oz of bourbon and give a final stir. you may add a small spritz of soda as well. Garnish with a strip of orange peel and enjoy! I love a good old fashioned and I’m definitely pro-cherry! Your recipe looks delicious – what a great cocktail for the weekend! I love your video! Your drink looks so refreshing! Perfect for the weekend. This cocktail looks and sounds amazing. Bookmarking it for the next weekend! Being from WI, I am very well familiar with Old Fashions. I like them made best with bourbon, as in your recipe. Cheers! Old fashioned are on the top of my drink list! I have these strawberry ocotillo bitters that I love in them! Old Fashioneds are my favorite, too! Though I’m partial to anything with bourbon 😀 Your bar tools are on point, love the copper! Oh yum!! Bourbon old fashioneds are the way to go. I didn’t think I liked them prior to trying it. I have a friend who prides himself on his old-fashioned making skills and that was the first time I tried a bourbon based one. YUM!!! Your version looks super delicious. OMG!!! That is a delicious cocktail! The fragrant orange peel makes this drink….of coarse those amazing Luxardo Cherries are so delicious! I didn’t have the Angostura bitters so I used grapefruit bitters. So yum! I’m so happy you enjoyed it Gwen!